At the James Webb Auditorium at NASA Headquarters in Washington, NASA scientists elaborated on the TESS planet hunter mission details. Here we've compiled fascinating insights given during the news briefing. On March 28th at 1 p.m. CST, NASA discussed the upcoming launch of the Transiting Exoplanet Survey Satellite. We were there! Here are our takeaways from the briefing. The session was presented on NASA TV and on the NASA website here. Watchers used #AskNASA on Twitter to ask questions during the live session. TESS will be tasked with building a map of 85% of the sky. It will use a 27-day orbit to map each hemisphere (north and south). TESS will work in conjunction with the James Webb Space Telescope (which was recently delayed to 2020). TESS will allow for density measurements of exoplanets. Planetary composition data will be available for the first time. TESS’s readings will be used to direct other telescopes to further explore detected exoplanets. TESS is the next step after Kepler, where its mission will be to further explore nearby planetary systems. TESS’s “sweet spot” is in looking for red, M-dwarf star systems (which make up 90% of the stars we know about in The Milky Way). These are relatively cool stars that are closer to our own Solar System than many of the exoplanet systems that Kepler found. TESS is about 700 lbs. and carries 100 lbs. of fuel. TESS will be the first spacecraft to use an orbit identical to the Moon’s orbit. TESS should be able to survive in this orbit for decades without any additional fuel. Kepler will be running out of fuel sometime this year, so TESS will be the next step for discovering exoplanets as well as Kepler’s replacement. TESS scientists have been studying simulated light data for months. As soon as TESS data starts rolling in, they will be able to detect exoplanets readily. TESS has a flash drive full of exoplanet drawings by children and fans that will travel along with the satellite. 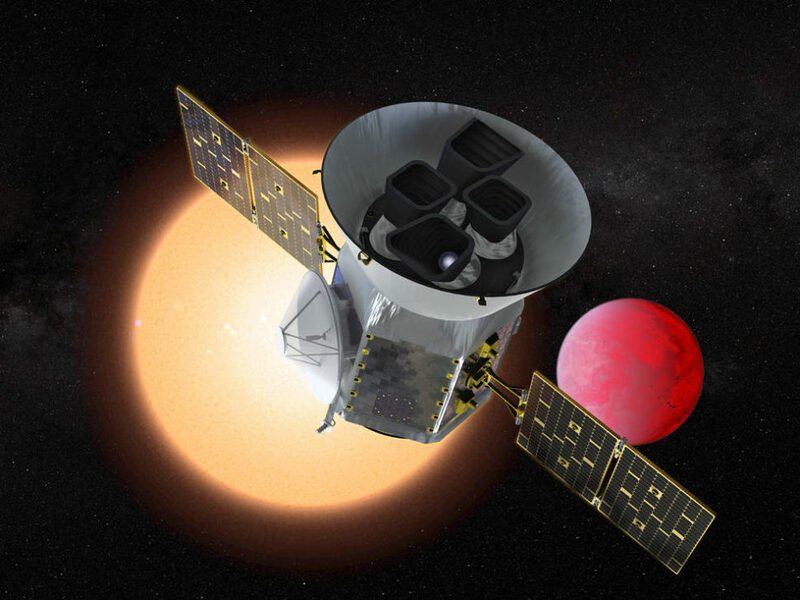 TESS expects to find at least 300 Earth or super-Earth sized planets. All of Kepler and TESS data is available to the public in the MAST archive. At the James Webb Auditorium at NASA Headquarters in Washington, astrophysicists talked about the upcoming April 16th launch and mission of the Transiting Exoplanet Survey Satellite (TESS). It will be launched on a SpaceX Falcon 9 rocket. TESS will image the entire sky, and capture over 500,000 stars in detail. Specialized lenses will filter starlight in order to help in find exoplanets, hence the moniker “planet hunter”. During its mission, TESS will explore an area 400x greater than the Kepler Space Telescope. The James Webb Telescope, which was recently delayed until May 2020, will take TESS data and, using huge, specialized lenses, take a much closer look at exoplanets. The James Webb will likely be able to detect atmospheres and terrestrial compositions of planets light years away. What are you most excited about regarding TESS and its mission? See you on launch day, April 16th!